A good news article can become the basis of a great marketing communications effort. Let’s face it bad publicity can really set any business back really badly. Take Qantas a few years ago, with all the union trouble that the company had that forced Alan Joyce, the CEO, to shut down the airline. And, my memory of this sad state of affairs was the union head who called on the public to boycott the airline. Talk about bashing the brand, this was biting the hand that fed you. But, of course, the guy worked for the union, so he was ok. But, I digress. I really got so riled up that I wrote to Alan Joyce, in support for his efforts, then humstrung by a Labor government. Anyway, for the good news. It’s taken years for the company to reclaim the goodwill that it had. And, with the clean slate that the company did writing off the books losses that were pulling their figures down, the company’s shares have really shown a resurgence not seen in years. Admittedly, this was from a low base, with the share reaching lows of a little over a dollar, it is now trading over $2.00. Now, this blog, doesn’t dab into economics or investing share market. Though, I must confess to owning some Qantas shares and the fact that my wife works for the company. I write this post from a marketing communications perspective. Now, we have really good news. Something, we Aussies have known for a long time, Qantas’s safety record. If you cast your mind back to the 1988 film, Rain Man, starring Dustin Hoffman and Tom Cruise, you may remember the former who was scared of flying noting that there was one airline that was really safe….Qantas. Ok, that was a movie, but now this is an official finding and it’s in the news. Qantas is now rated the world’s safest airline. Well, I checked the Qantas facebook page. No mention. Haven’t check all the other social media, but if I were Alan Joyce, I’d get the team moving quick smart to take advantage of this great piece of news. As an Australian, I am proud of all things Australian. And, this includes our own airline. 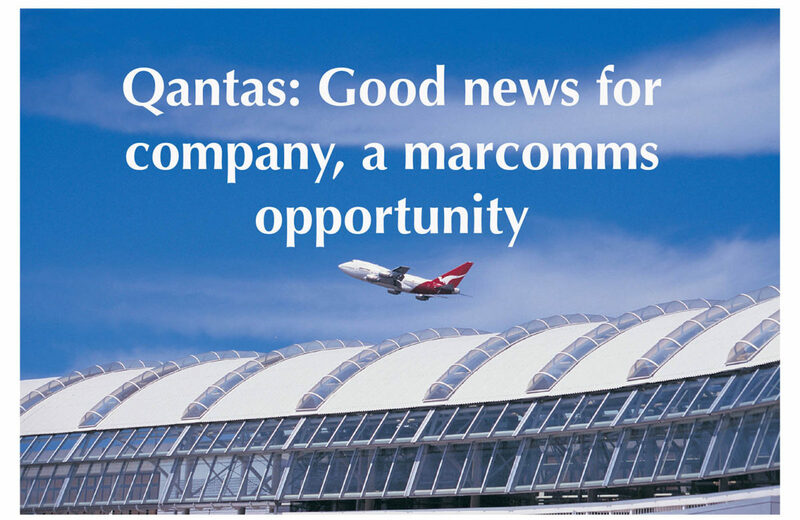 Well, marcomms at Qantas, I hope you take advantage of this. Mind you, a new ad campaign is probably already being worked on based on this bit of news. Probably something along the lines of the “Staying Alive” campaign by Volvo. Though the company did not invent the vehicle safety cell (a Mercedes Benz invention), they pushed the safety of the vehicle, which was easily attributed to Volvo by their marcomms effort. Well, just some thoughts on some good news.